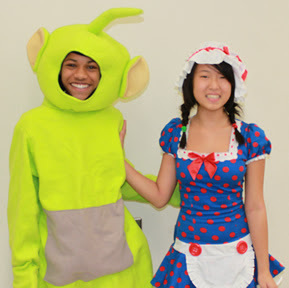 Each year, ITA encourages students to look deep within themselves to come up with the BEST Halloween costumes possible. While few students participated this year, the costumes did not disappoint. Not only did these students have the opportunity to go trick-or-treating in each of their classes, but ITA staff was on the lookout for the most creative, fun, inspiring, or well-executed costumes. Without further adieu, I present to you the Halloween Costume Contest participants of 2011! This student sported the unofficial uniform of the US Women's soccer team. Our very own Party Rock Anthem Robot! It was impossible not to smile when walking past Dipsy, the green Teletubby. Here is a very convincing crusader, complete with sword and chainmail! I’m not even sure who this ninja was; this costume was just that good! Wow! Nice interpretation of Raggedy Ann, red Converse and all! You rock! Arrrrrr, mateys! This here be another ITA student as a pirate! We even had a mime costume. And, some nice miming talent along with it! Our runner-up is a TIE between Dipsy and Raggedy Ann. Each of them will receive a $20 Best Buy gift card! This year’s costume contest winner is the robot from LMFAO’s “Party Rock Anthem” music video. He will receive an iPod shuffle and a $15 iTunes gift card! A huge thanks to Mary, Sarah, Brianna, Brenna, Ian, Ninoska, Adrian, Josh K., and Islam ! You will each receive a raffle ticket for the End-of-Semester prize raffle! !